Brock “Hey, I’m still here” Holt with two nice plays at 3B that inning. Wonder how much the #RedSox pay those adults to do the Wally Wave? Must be a lot. Encarnacion just hit a HR at Fenway that had the crowd gasping. 2-0 Jays. This ring is actually pretty hefty. Noted slugger Erik Kratz takes Doubront out to center field. 3-0 Jays. #RedSox loaded the bases on two walks and a one-hopper the pitcher dropped that was called a hit. Here’s Bogaerts. Interesting spot for Bogaerts right here. Can kind of make a point without saying anything. Bogaerts hit a rocket and the 3B turns it into a double play. Nieves came out to talk to Doubront. Now Farrell and a trainer. Doubront could have whiplash based on the five extra base hits. He’s coming off the mound now. 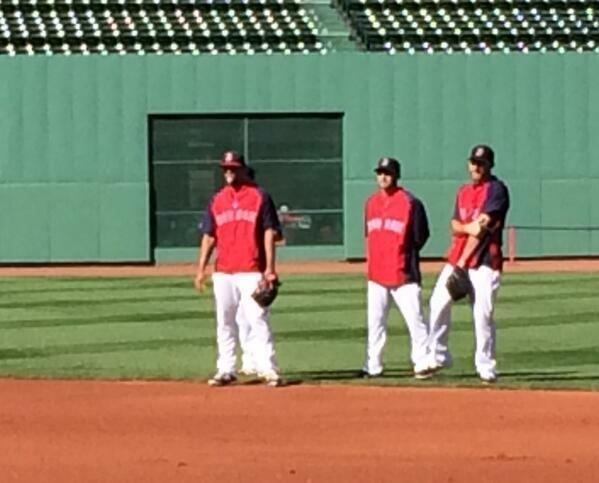 #RedSox , I believe, were one of 2 or 3 team to use five starters this season. Suspect that’s about to change. 6-0 Jays. Maybe the Sox can bring back Ryan Dempster next. 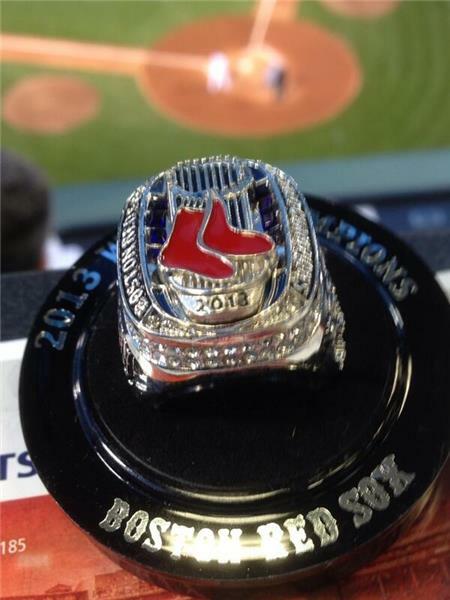 Fans at Fenway got replica World Series rings tonight. The Blue Jays all got extra-base hits. 7 so far in 4+ innings. Red Sox sign Stephen Drew and Xander Bogaerts makes 2 more E's, extends team lead to 6 for season. 2nd error for Bogaerts. Guessing that pre-game meeting wasn’t so cheery. Bradley doubles in a run. Red Sox hold off on calling Johnny Damon. Melky Cabrera two doubles and now a HR off the Pesky Pole. 7-2 Blue Jays. Blue Jays' 9th hit of game is their first single, Bautista with 2 outs in 6th. 4 HRs, 4 doubles. Lead Red Sox, 7-2. The Red Sox need an assistant GM in charge of convincing everybody else not to sign former NL closers. In this game, Doubront's ERA has gone from 4.54 to 5.12. Mujica's ERA has gone from 7.71 to 8.04. #RedSox will be represented at the draft by Derek Lowe and scout Jim Woodward. Drew signs officially with #redsox and Doubront on DL. The Doubront story must be true. Nobody would make up, right? Drew thinks he'll need about 9-10 games to get ready. "Straight Outta Compton" playing at Fenway. New Stephen Drew walk-up song maybe. Drew: I'm excited, it seems like I haven't left, which is a great feeling. 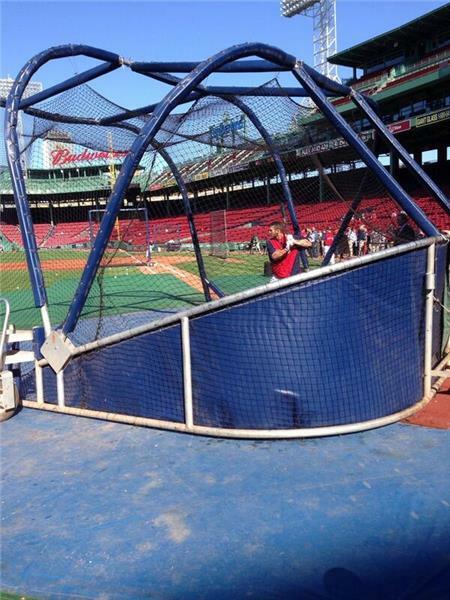 All RH swings for Victorino in BP on the field so far. Cherington: We believe Xander can play SS, play it well...just tyring to make the team better. Napoli out of starting lineup with flu-like symptoms. Sizemore draws a leadoff walk. New lineup looking good so far. Lead-off BB and 2-out SB for Sizemore. Stephen Drew is active and available to #RedSox tonight. Could be optioned Friday. Has to clear waivers first. Another HR for Encarnacion. Leading off 2nd, on 2-0 FB, laser into 1st row of Monster seats. #BlueJays 1, #RedSox 0. Another rocket off Buchholz. This one a HR by Encarnacion. That’s 22 hits over 11.1 IP last three starts.